Whether you've misjudged a corner and ended up in a ditch, or some fool has taken you out, leaving you on your ear, the chances are your bike will have sustained some damage. If you're involved in a heavy accident a tow truck will normally be called out to collect your bike before taking it to a dealer for a full estimate. However, if your bike is reasonably straight you should assess the damage as soon as possible. 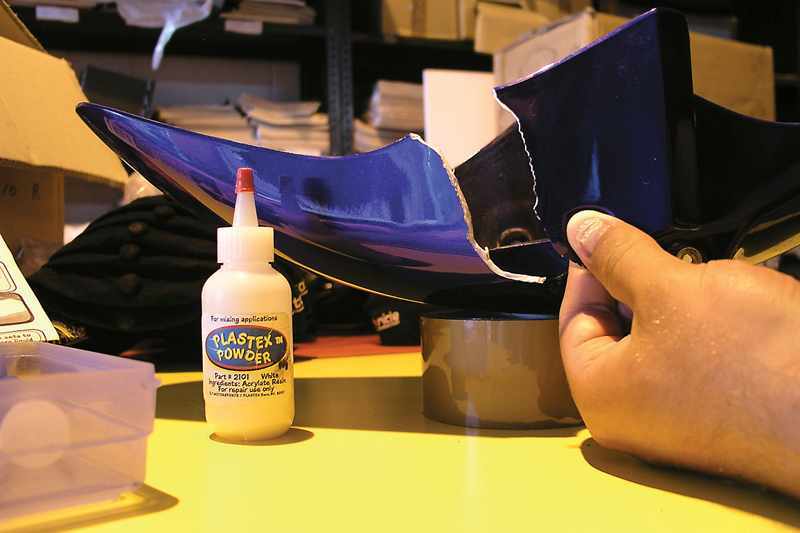 What may seem like nothing more than a few scratches can soon add up to a hefty repair bill. Before you start to assess any damage, think about how it was caused. What sort of speeds were involved? Where did the main impact occur? This will help make sure nothing is missed. Start at the front and work towards the rear, one side at a time. Make a note of any part, however small, that has the slightest hint of damage. When you come across a damaged part check the part it is attached to for damage. Get the bike on its centre stand or paddock stands, centre the steering and, by looking down either side of the bike from the lowest point on the front wheel you will be able to tell if the steering is in line. Unless you have had a heavy front end collision, which will usually result in bent forks, or worse, a bent or twisted frame, there is unlikely to be major damage. If the handlebars are in line and the front wheel is pointing slightly left or right simply turn the bars to the opposite lock and push the wheel against the stop with your foot. This will twist the tubes in the legs and should put them back in line. Look for damage to the fork bottoms. Even the slightest cosmetic scuff could put a potential buyer off. Remember, people will always think the worst; some may see minor scuffs as a sign the bike has been involved in a high speed smash. Check the underside of the front brake calipers. If there are signs of damage or impact it's important to make sure the sliding pins are not bent. This can be quite common on SV650s. You can't replace just the sliding pin, instead a new caliper will be needed. Rotate the front wheel and check for buckles or run-out to the rim and the discs. There are one or two companies that can repair cast alloy wheels, but when it comes to brake discs any more than a 2mm run out and they will need to be replaced. Take a close look at the headstock to check for damage to the lock-stops. These tend to be quite soft and are easily damaged. Bear in mind specialist alloy welders will be able to rebuild the stops once the front end has been stripped. If your bike has a painted steel frame look for areas where paint has cracked or flaked off, especially around welds and on the headstock. This is a sign that the frame is bent. Most front brake and clutch levers have a weak point manufactured into the lever design, a groove through the lever about a third of the way from the end. Usually if a bike goes down the lever will break at that point leaving enough lever to continue riding, although a lever with its end missing would fail an MoT so will need replacing. Bent levers will also have to be replaced as there is no chance of straightening them without snapping. Check the handlebars for alignment by moving from lock to lock and measuring the distance from the end of the bars to a fixed point on the bike, assuming the lock-stops aren't damaged of course! Don't waste time trying to straighten them - there's no chance of them ever being perfectly straight again. Have a look for where the bar end weights may have turned into the bike. On early FireBlades it was common for the end weight to ding the frame even if the bike fell over at a standstill. The ding can be repaired by building the damaged area up with weld and polishing it out, but prospective buyers, particularly dealers, will be suspicious of a polished frame and will be less likely to offer sensible money for your second-hand bike. Check the throttle for free movement. If the bike has gone over on its right side the bar end weight may be forced into the throttle tube. There's also a locating pin on the inside of the switch housing which stops the switch gear from turning with the throttle; this can snap off and is hard to repair. 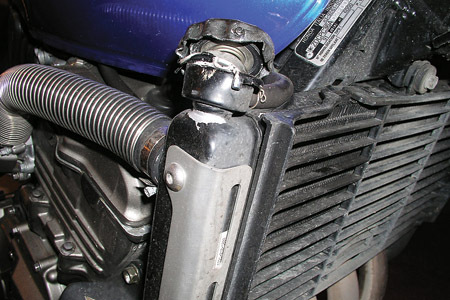 Damaged footrests and footrest hangers are easy to spot by taking a look at both sides from above the bike. It will be almost impossible to straighten alloy footrests or hangers without them snapping. Have a look behind the footrest assembly for damage caused by the footrest being pushed into the frame or swingarm, especially if the bike has been ridden since the accident. With the front end in line take a look at the bike from the rear to check the subframe is true. Soft alloy subframes are easily twisted or bent and are difficult to straighten. Finally remove as many panels as possible and check for cracks and broken lugs. Most panels can be repaired and repainted, although a number of manufacturers fit many small panels rather than one big one these days to keep the cost of repairs down, so it's worth checking the prices of both painted and replacement panels. With all the panels off check for damage to fairing brackets, including the main support at the front. It's very hard to straighten these.Run the bike to check for oil or water leaks. A hairline crack in an engine casing or radiator may not be apparent until the engine warms up. If you need to replace an engine cover make sure you order the necessary gaskets. Radiators can be repaired, but in most cases will need replacing. On most bikes one of the first parts to go down will be the silencer. Genuine silencers are very expensive, but remember that the closer to standard your bike is the more desirable it will be and the better it will hold its value. Once you have noted every damaged part you will need to call your dealer or drop a list of parts in for pricing. They will be able to price it up using genuine and pattern parts, where available. Make enquiries with specialist repairers to have paintwork or welding work carried out. Once it's all priced up you can decide whether you want to carry out repairs yourself or, if the total bill is escalating, you may want to consider putting in an insurance claim. 10. Here's a knackered radiator. Small holes in the core can be fixed, but crash damage like this is terminal. New ones cost a packet, too. Oh dear. Finally remove as many panels as possible and check for cracks and broken lugs. Most panels can be repaired and repainted, although a number of manufacturers fit many small panels rather than one big one these days to keep the cost of repairs down, so it's worth checking the prices of both painted and replacement panels. With all the panels off check for damage to fairing brackets, including the main support at the front. It's very hard to straighten these. Run the bike to check for oil or water leaks. A hairline crack in an engine casing or radiator may not be apparent until the engine warms up. If you need to replace an engine cover make sure you order the necessary gaskets. Radiators can be repaired, but in most cases will need replacing.